Villa Omni is a luxury villa in San Jose, only 3 minutes walk away from the centre of this beautiful village & its great choice of shops, bars, restaurants & supermarkets. 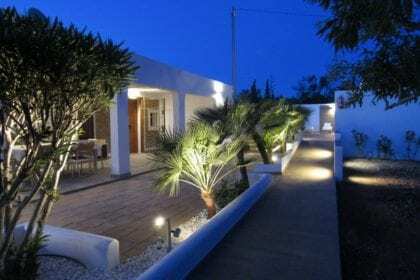 The property is a 15-minute drive from Ibiza Town, Playa den Bossa and only 5 minutes from San Antonio. This luxury holiday rental is a brand new build that was completed July 2016. The villa has been completed to the highest standard and no expense has been spared in finding the best fixtures and fittings. Villa Omni is a minimalist villa, designed by one of Ibiza’s most renowned architects. The panoramic views of Ibiza’s western ‘sunset’ coast seen from the property are as spectacular as the villa itself. 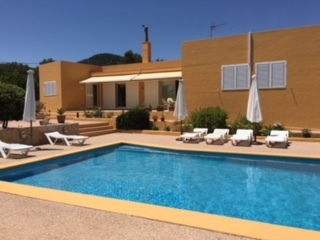 Villa Omni is very conveniently located, a mere 3-minute walk from the centre of San José, and close to all the wonderful beaches of the south-west coast of Ibiza. Access across the island is very easy, you will not spend hours driving down long “caminos” or to supermarkets. Entering the villa through an electric gate, you’ll find ample parking. Once inside the walled garden, the imposing minimalist building that is Villa Omni comes into view. Oozing with class, this holiday rental property has 6 bedrooms with ensuite bedrooms, comprising 5 ensuite bedrooms in the main house and one ensuite bedroom in the guest apartment. Entering the house directly into a large comfortable open plan modern living room, you’ll surely gasp in delight at the incredible sea views over the pretty countryside and rolling hills that surround San Antonio. The large, glass doors in the living room open up onto a wonderful terrace with a large dining table overlooking the pool area. To the left of the living room is a modern state of the art kitchen. There are 3 ensuite bedrooms to the left of the living room and 2 ensuite bedrooms to the right. Every bedroom has a wonderful ensuite shower/toilet and ample wardrobe space. Naturally, the main house has a good wifi connection, satellite TV, an alarm, the latest sound system and a modern safe. Next door to the pool is a wonderful modern annex with 1 double bed. The annex also has WIFI and an alarm. The generously sized terrace and wonderful pool area are perfect for “al fresco dining” and entertaining. The beautiful living room blends perfectly into the terraces. Best of all are the uninterrupted views across Ibiza. During the early evening, guests can enjoy Ibiza’s famous sunsets from directly in front of the house. The gardens are well kept, perfect for families and groups. We think you’ll love this luxury self-catering villa in San Jose. We believe that its amazing design & finish, location, and state of the art fittings truly guarantee you a wonderful home from home during your precious Ibiza holiday.